This is Autumn, your Dog of the Day Ireland correspondent, with the first installation in a series of happy, peppy, Guinness-loving* Irish dogs. I saw this guy as I was driving through Tulsk, County Roscommon, Ireland. He was spotted (but not literally) across the road from the Rathmore Mound, which was the site of a pre-Christian chiefdom. He’s probably paying homage to his royal doggy ancestors, perhaps leaving a tribute of MilkBones. 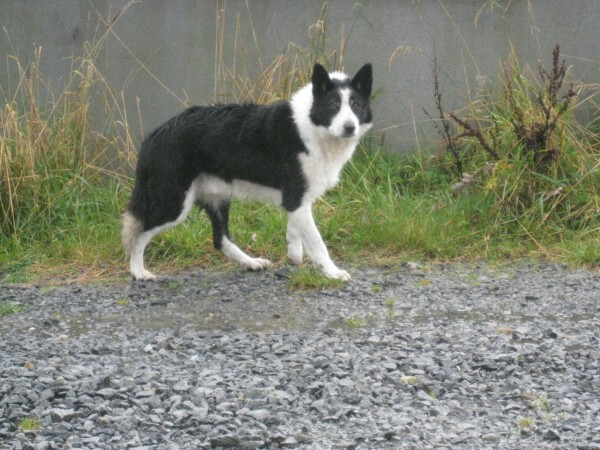 Many people think that all dogs in Ireland look the same – black and white, medium-sized, and moderately fluffy. The truth is that there are only 3 dogs in the whole country, all border collies, and they travel a LOT. *No dogs were intoxicated in the making of this photo. Finn MacCool's dog, Bran, was his great-great-great-great-great-x7 granddog. This entry was posted in Dogs out of SF and tagged Border Collie. Bookmark the permalink.